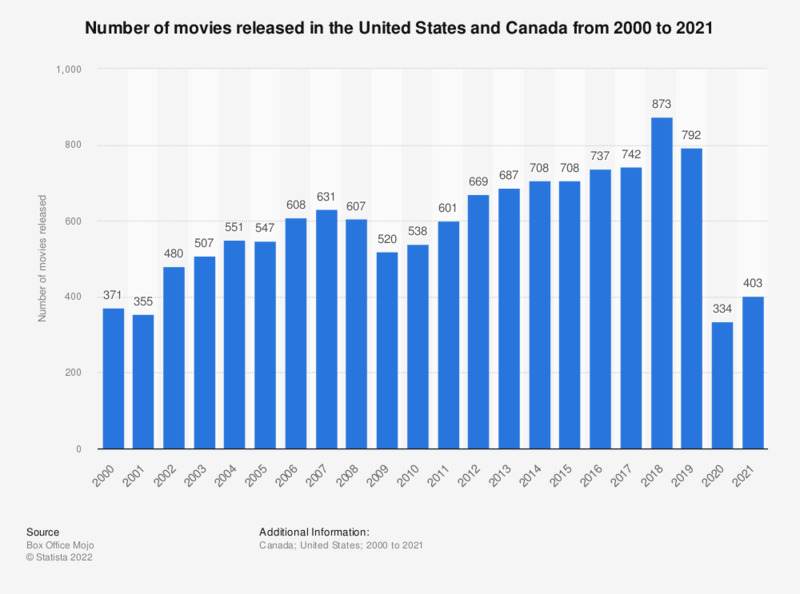 The statistic above presents data on movie releases in North America between 2000 and 2018. In 2018, 871 movies were released in the US and Canada, over 120 more than in the previous year. The number of movies released in North America has increased since 2000, overall. In 2000, 478 movies were released. This number grew to a height of 631 movies by 2007, but then tumbled to just 521 movies in 2009 in response to the U.S. and global economic crisis. Since then, the industry has been rebounding, reaching its highest number of movie releases to date at 868 movies in 2018. Despite a fall in the number of films released in 2008 and 2009, the industry did not experience a decline in box office revenue. Box office revenue actually climbed from 9.6 billion U.S. dollars in 2008 to 10.6 billion U.S. dollars in 2009. Though movie theater attendance in the United States has trended downward since 2002, attendance bumped up in 2009 from 1.34 billion attendees in 2008 to 1.41 billion. A decade later, 14 percent of surveyed Americans reported never going to see movies in a movie theater, according to data from October 2018. Despite this surprising statistic, the North American movie industry is the largest in the world, accounting for roughly 35 percent of global filmed entertainment revenue in 2012. Filmed entertainment in the U.S. generated 30.7 billion U.S. dollars in 2012 and is project to reach 36.4 billion by 2017. The 650 films released in the U.S. and Canada in 2012, generated 10.8 billion U.S. dollars in box office revenue. Among the top releases at the box office that year were “Marvel’s The Avengers,” “The Dark Knight Rises,” “The Hunger Games,” and “Skyfall.” Of the leading film studios in the USA, the greatest number of films, 19 total, were released by Sony, which accounted for around 17 percent of the North American box office that year. Sixteen films were released by Universal, earning the company over 1.3 billion dollars at the box office.